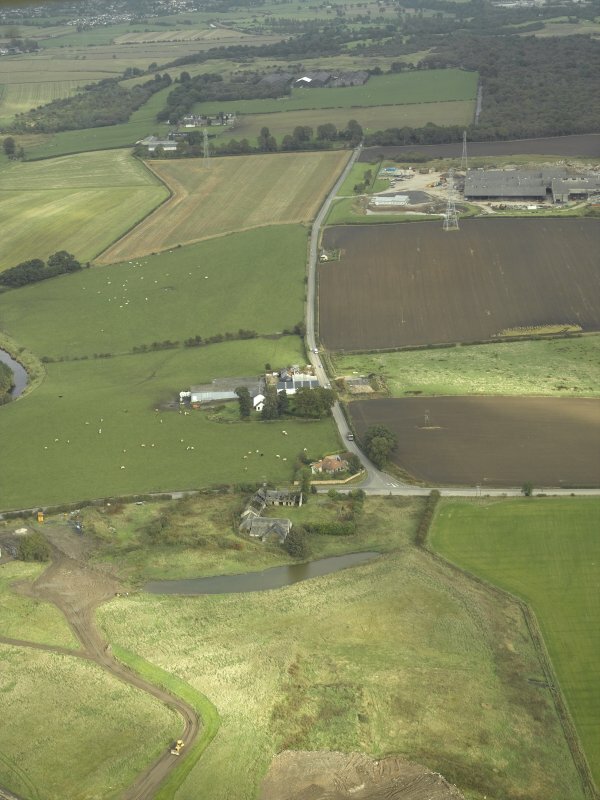 SE oblique aerial view of Balmuildy Roman fort, the course of the Antonine Wall and adjacent Balmuildy road bridge. 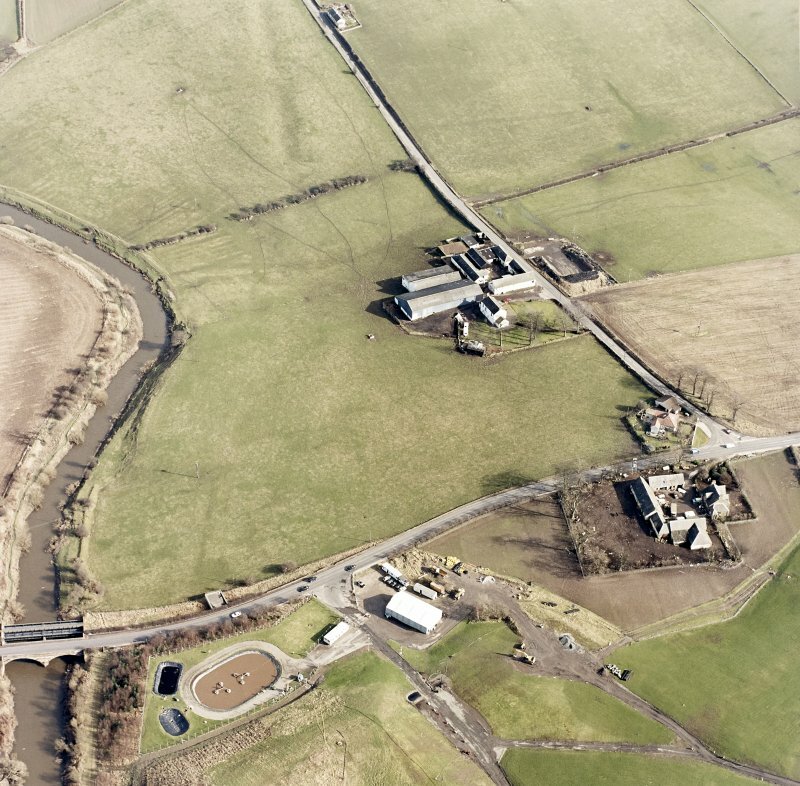 Oblique aerial view centred on the site of the Roman fort and the course of the Antonine Wall with the road bridge adjacent, taken from the E.
Aerial view of Balmuildy fort and the Antonine Wall (c.584 718), taken from the W.
Aerial view of Balmuildy fort and the Antonine Wall (c.584 718), taken from the NW. 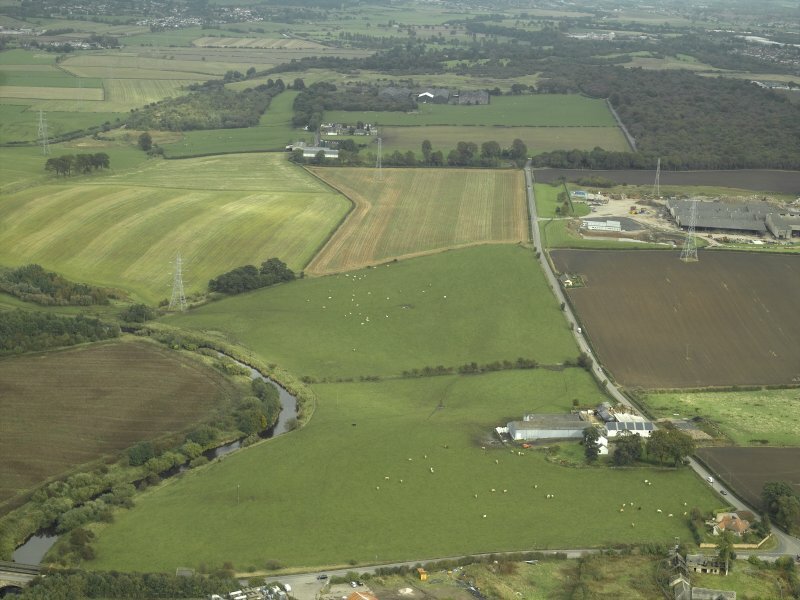 General oblique aerial view centred on the site of the Roman fort and the course of the Antonine Wall with the brickworks adjacent, taken from the WSW. 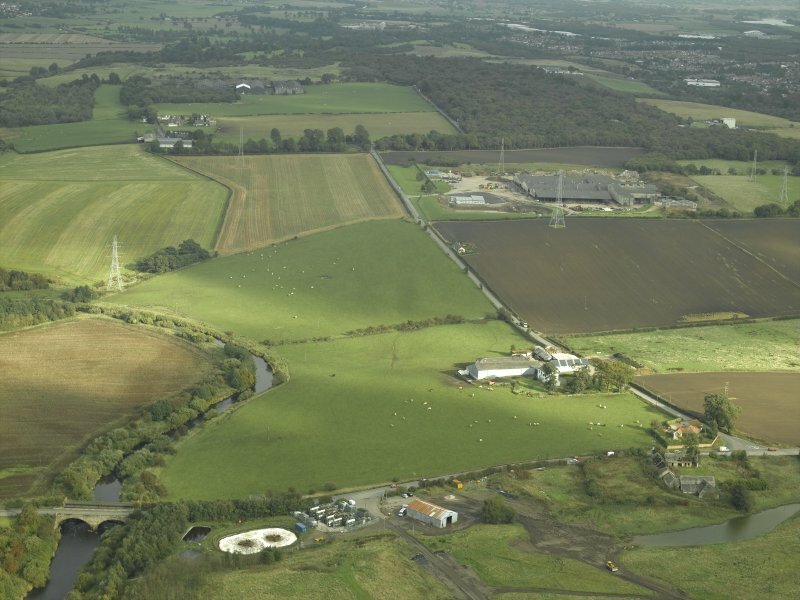 General oblique aerial view centred on the site of the Roman fort and the course of the Antonine Wall with the road bridge and brickworks adjacent, taken from the W.
Aerial view of Balmuildy fort and the Antonine Wall (c.584 718), taken from the NE. 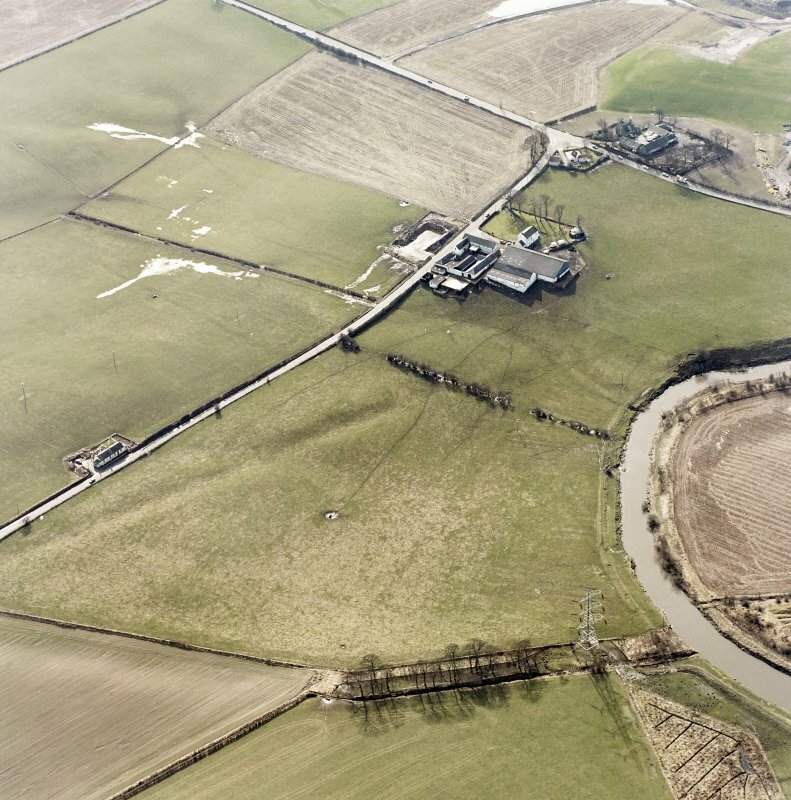 Aerial view of Balmuildy fort and the Antonine Wall (c.584 718), taken from the SW.
Oblique aerial view centred on the site of the Roman fort and the course of the Antonine Wall, taken from the W.
Oblique aerial view centred on the site of the Roman fort and the course of the Antonine Wall, taken from the NNW. 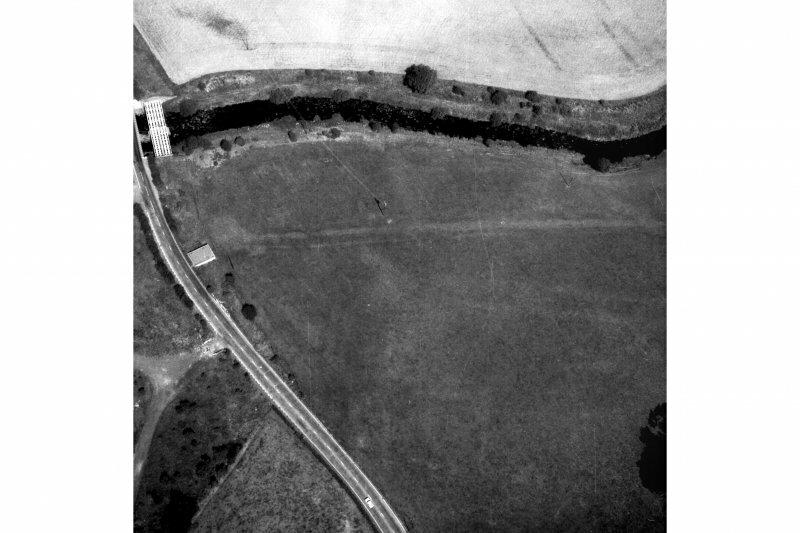 General oblique aerial view centred on the site of the Roman fort and the course of the Antonine Wall with the road bridge adjacent, taken from the SW.
Not to be confused with Balmuildy Roman temporary camp (centred NS 5860 7220), for which see NS57SE 15. 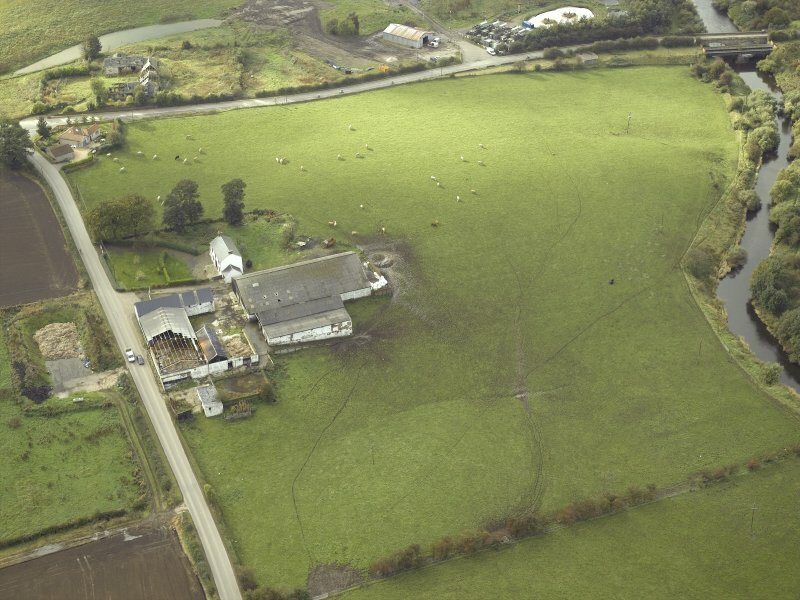 For possible Roman fortlet at East Balmuildy (NS c. 58 71), see NS57SE 28. For Roman inscripton at NS 581 717, see NS57SE 118. 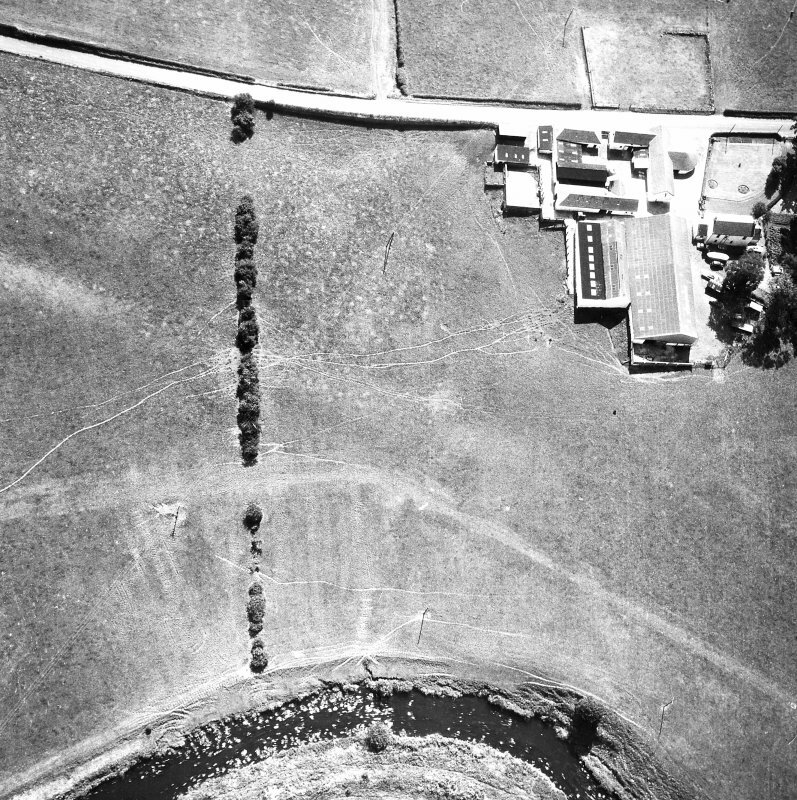 No trace of the Roman fort at Balmuildy can be seen on the ground (RCAHMS 1978; Miller 1922). 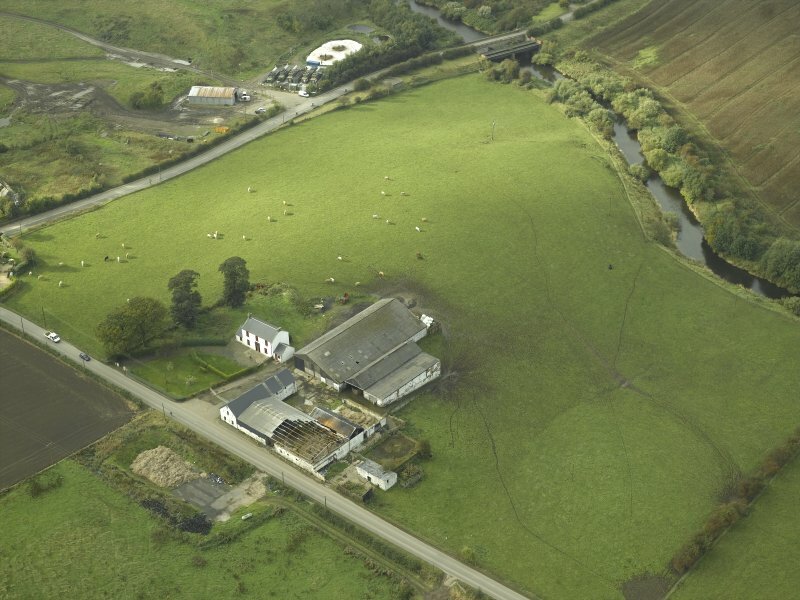 It stood on the S bank of the River Kelvin immediately NW of Easter Balmuildy farmhouse. 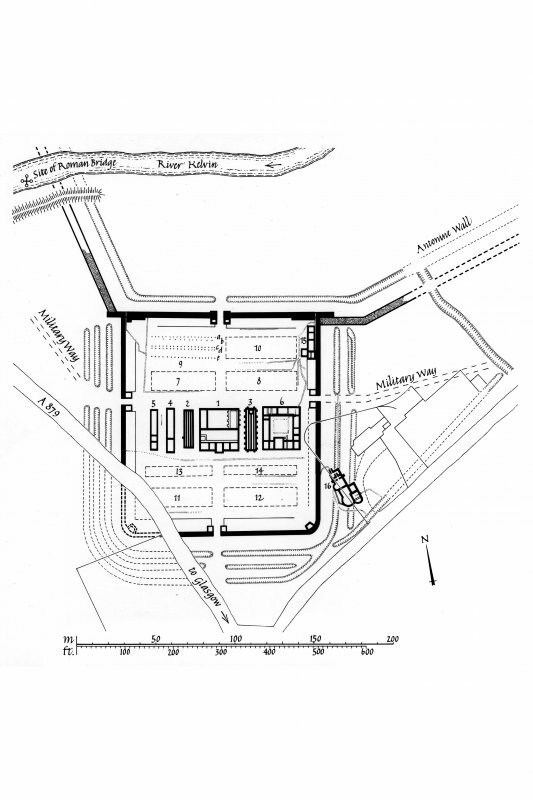 Present knowledge of the site is largely the result of excavations by S N Miller in 1912-4. (See plan.) It occupied the N slope of a gently inclined plateau, being protected in Roman times on the N by the river, on the E by a steep- sided gully, and on the W by an extensive area of marsh. Facing N, it had been defended on all sides by a stone wall and measured internally 140 m by 126 m, an area of 1.8 ha (4.4 acres). The wall, which rested on a heavy cobble foundation, had been almost entirely removed, but it could be calculated that it was about 2.3 m thick on the E side and probably somewhat more on the N; at the back there was an earthen rampart bank 6.1 m thick. 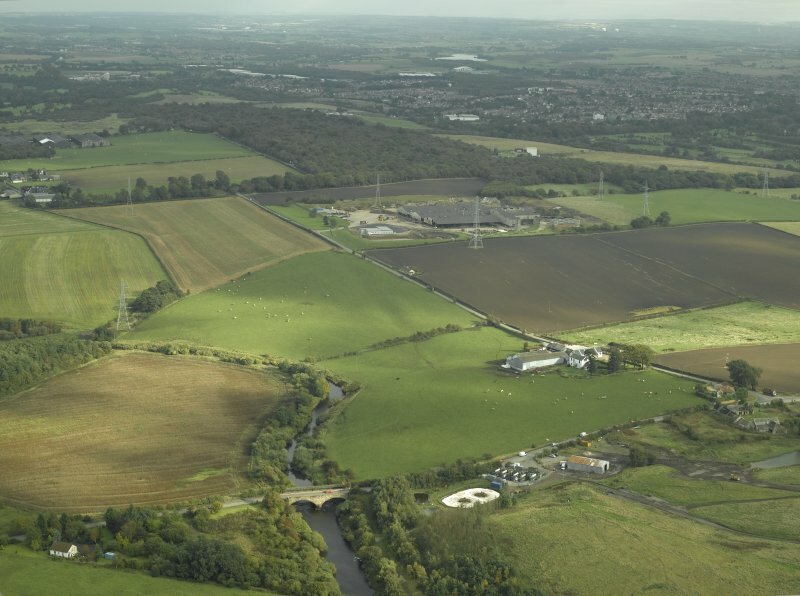 It was evident that the construction of the fort had been begun, if not completed, before the builders of the Antonine Wall arrived. On the more vulnerable S and W sides the fort was defended by three ditches, but by only two on the E; all were of similar size, but the outer ditch on the N half of the E front exhibited a midrib, which may have been the result of recutting. 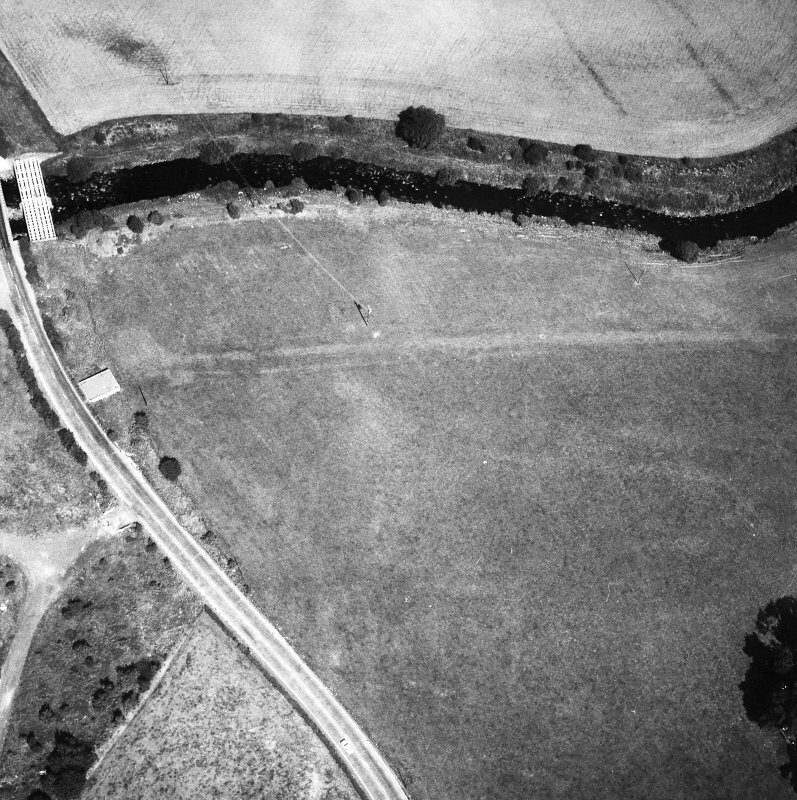 The gates appear to have been of uniform design and size, but only that on the N, opposite a causeway in the Antonine Ditch, was sufficiently well preserved to enable its original appearance to be reconstructed. Fragments of an inscribed slab show that the original masonry work of the fort was carried out by the Second Legion. In the interior, the buildings of the central range (1-6) and the bath-house were of stone, but to judge from the one example (9) fully explored, the barracks were of timber. The headquarters building (1) was of orthodox plan, but had undergone a number of major alterations. A granary (2, 3) lay immediately on each side of (1). The two narrow buildings (3, 4) were tentatively identified as workshops. The bath-house (15) had also been rebuilt. 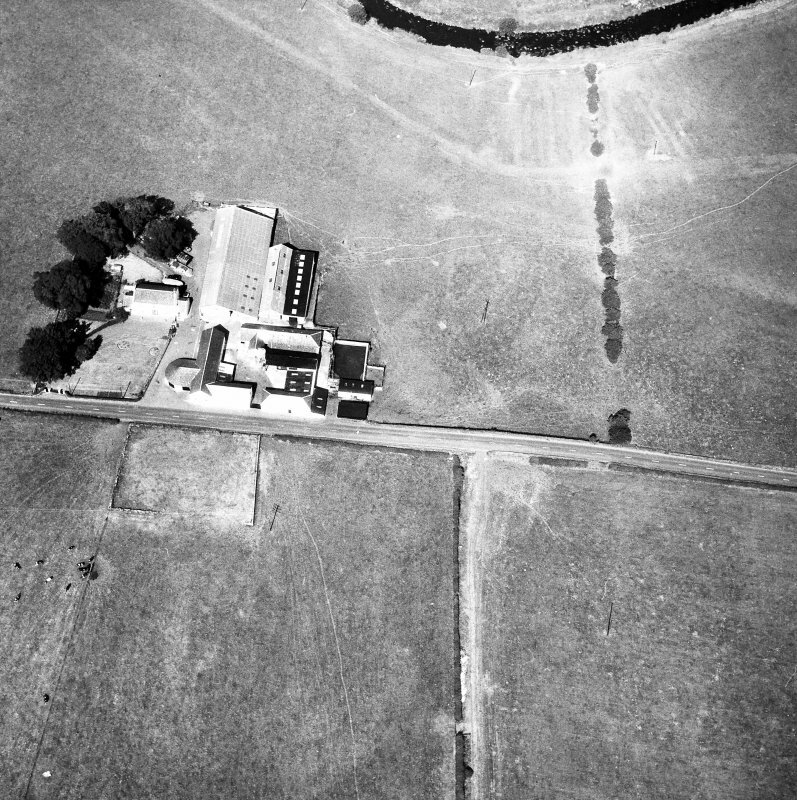 Buildings (7-12) were identified as barracks, while (13, 14) were probably storehouses. 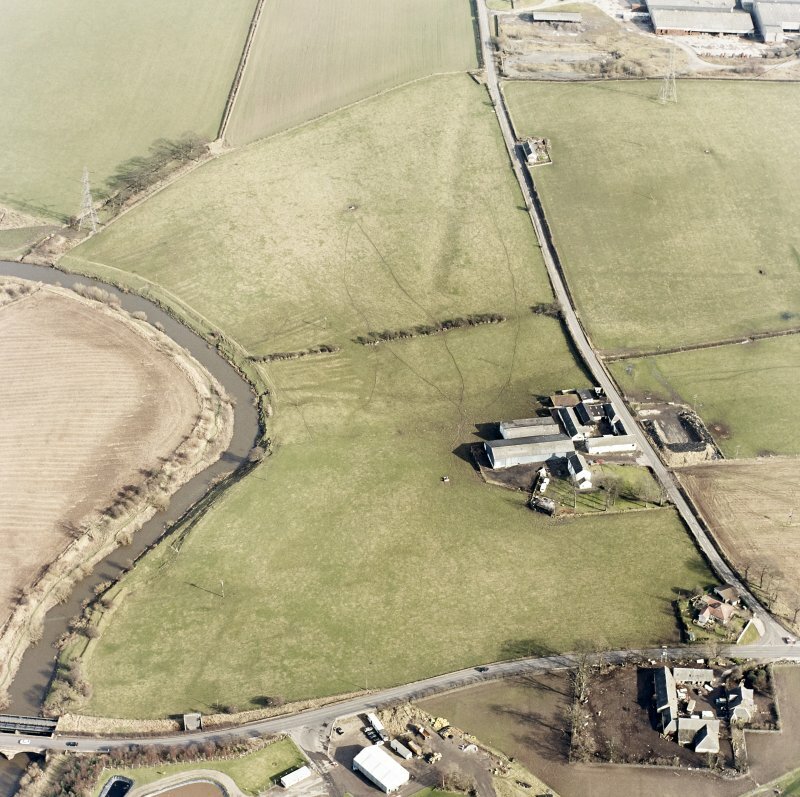 On sloping ground to the E of the fort lay a small annexe, bounded on the SE by a single ditch and on the NE by the deep channel formed by a tributary of the River Kelvin, now silted up. Within its SW corner, partly overlying the fort ditches, was another bath-house (16), which was both larger and more elaborately built than the other, but had apparently been carefully demolished after only one period of use and not subsequently rebuilt. The annexe also appears to have contained a large number of timber structures of an insubstantial nature. No evidence was found to suggest that the site had been occupied in the Flavian period. The two bronze coins of Domitian found inside the fort could have been lost in the 2nd century, and the late South Gaulish samian ware is now thought to have been brought into Scotland in the Antonine period. However, although it is clear that the occupation of the fort began about AD 142, it is still uncertain when it was finally abandoned. The most that can be said is that no more than two periods of occupation are indicated. Visited by OS (W M J) 14 August 1951. S N Miller 1922; RCAHMS 1978. 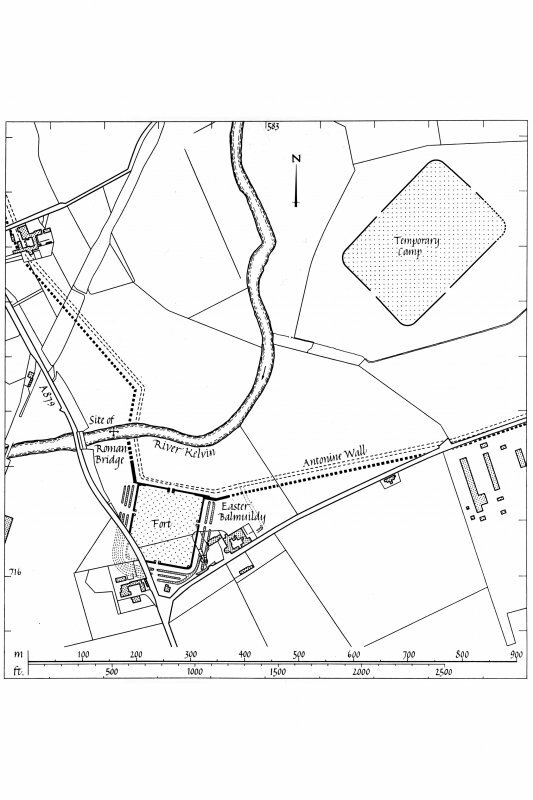 NS 5809 7157 A road improvement scheme at the Balmore Road/Balmuildy Road junction necessitated a programme of archaeological work due to the close proximity of the works to the Scheduled Area of Balmuildy Roman fort. 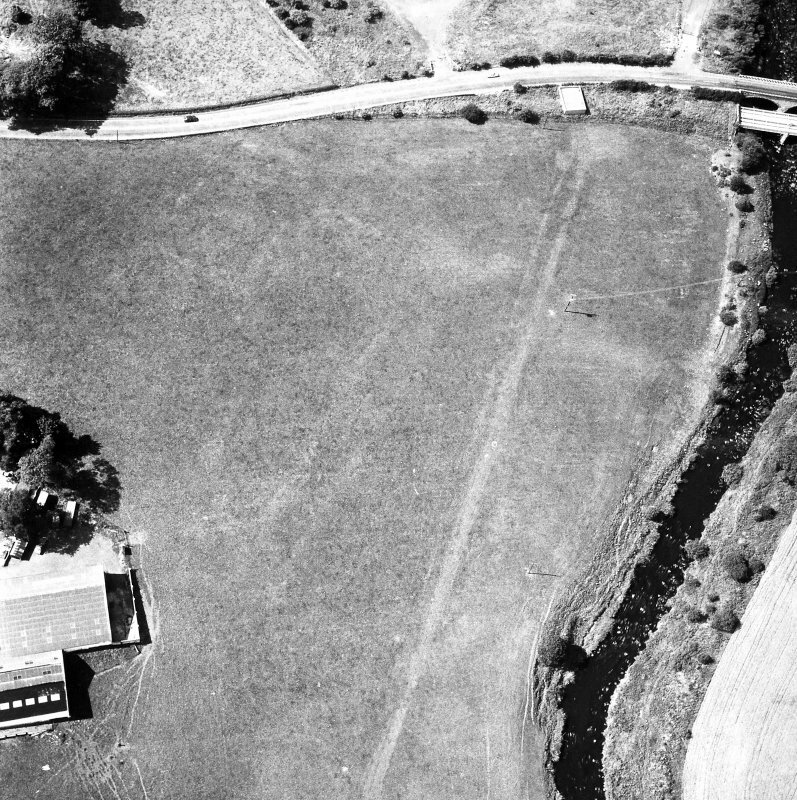 Two ditches of the fort were located within the Scheduled area. Their excavation revealed that they had not, as anticipated previously, been disturbed through earlier excavations by Miller. 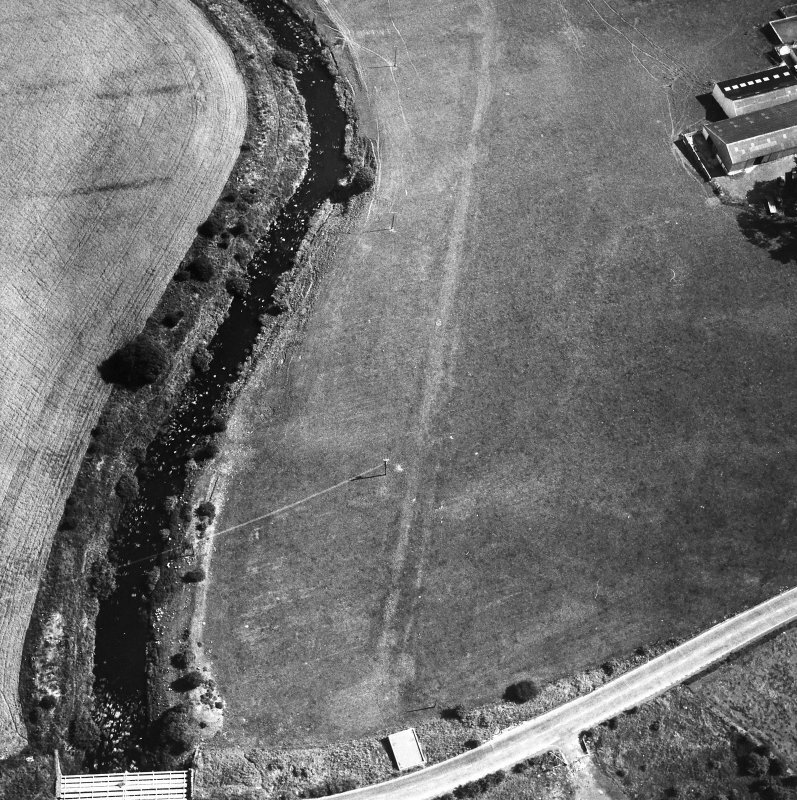 Rather, within one of the ditches waterlogged conditions had promoted the preservation of organic material, while in the other ditch terminal sherds of Roman pottery were recovered from the primary fill. An archaeological watching brief was also undertaken in the vicinity of the Scheduled area. The only feature of significance identified was a cobbled surface lying beneath the modern road make-up. (GUARD 776). P Duffy, A Leslie and G MacGregor 1999. 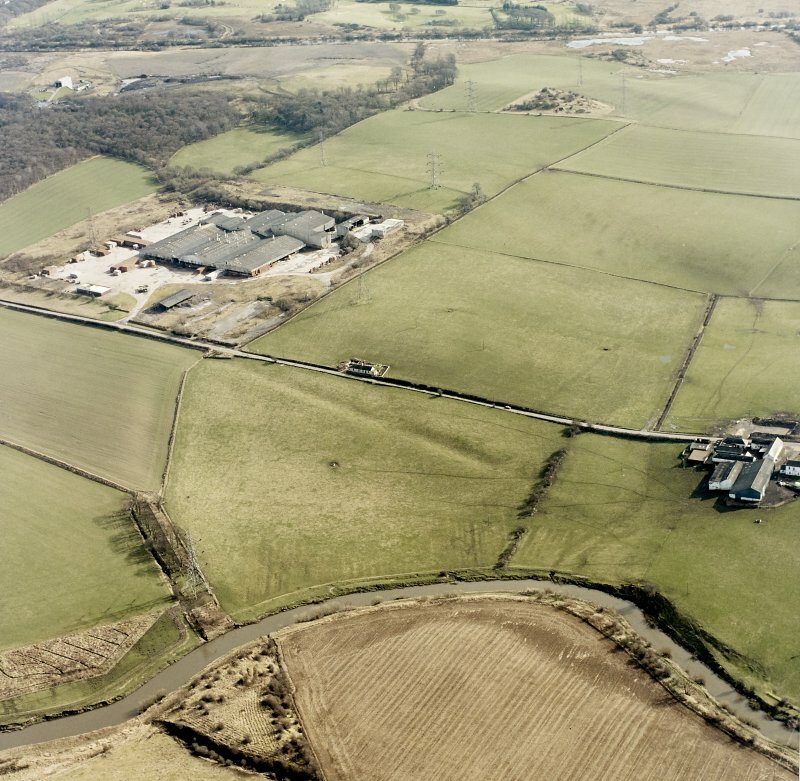 (Scheduled with adjoining length of Antonine Wall). Information from Historic Scotland, scheduling document dated 2 February 1999. NS 581 716 (centre) A desk-based assessment and field evaluation were undertaken in January 2004 to assess the presence of archaeological remains within a development area. 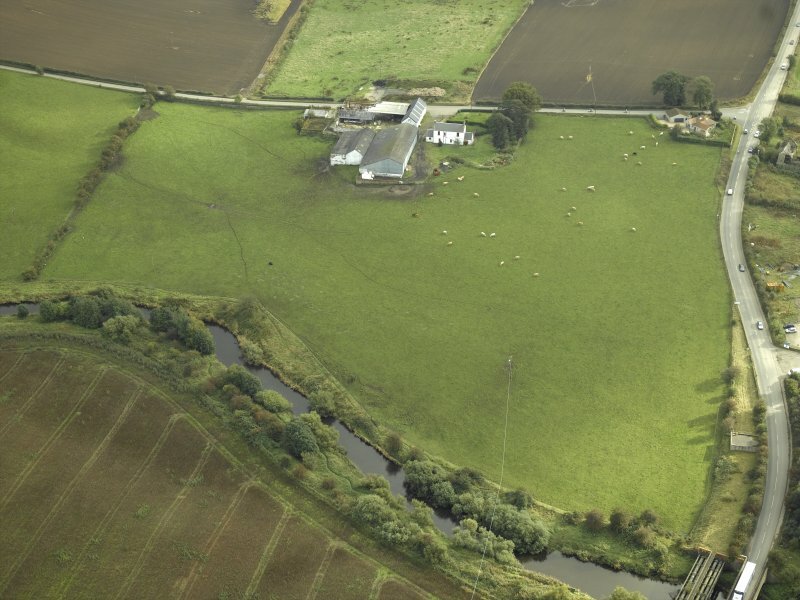 The remains of a probable ditch were encountered, which almost certainly relates to the defences of Balmuildy Roman fort (NS57SE 12), situated to the immediate NE of the site. No excavation of archaeological deposits was undertaken during the fieldwork. Sponsor:	Renewable Energy Systems Ltd.
NS 5811 7169 The purpose of a geophysical survey (magnetic and resistivity) between April and September 2005, which covered an area of nearly 11ha, was to locate structures in the immediate environs of the site with particular reference to possible civilian settlement at the time of the fort (NS57SE 12). To the S and SE of the fort, S of Balmuildy Road, numerous features were found, some of which could be associated with prehistoric occupation, notably in the area of the Summerston landfill site. What may be a stretch of the military way was detected some 200m E of the fort. 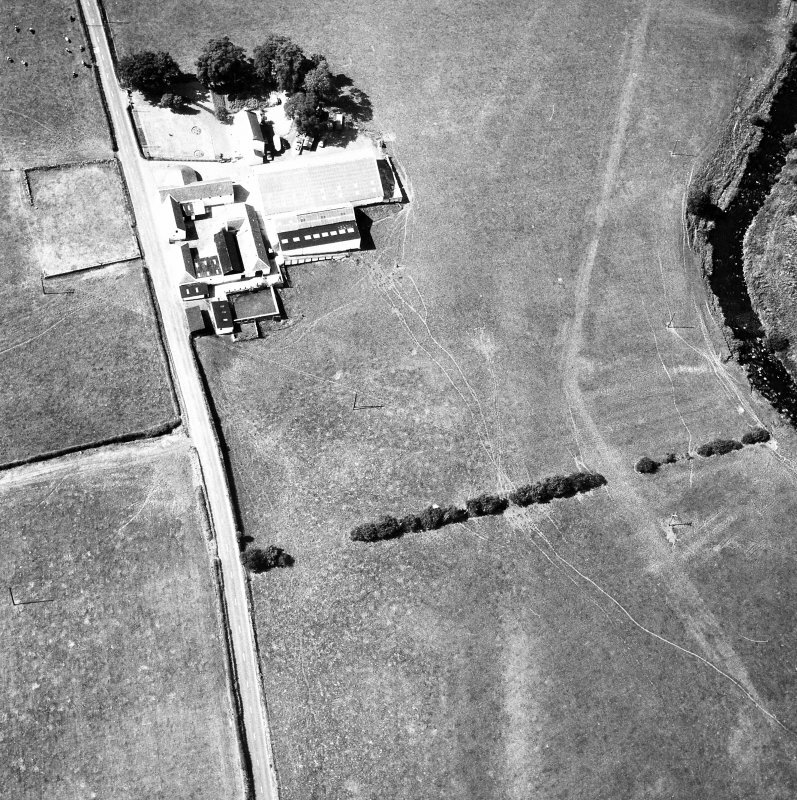 As a result of modern agricultural activity, the results S of Balmuildy Road generally lacked the clarity of those obtained within and E of the fort on the N side of the road. 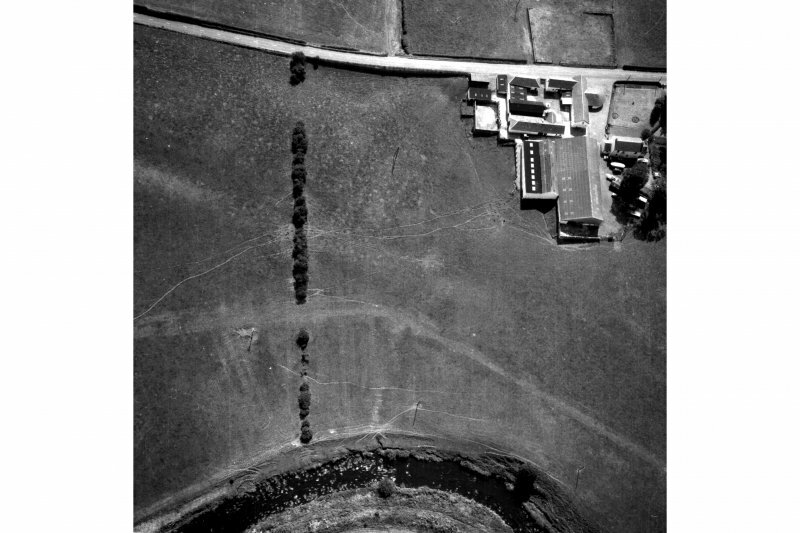 Here, there is much interesting detail, ranging from the interface of the fort and the wall, which may require some re-evaluation of Miller's original interpretation, to the presence of a small structure, c 100m E of the fort, which could be a fortlet. 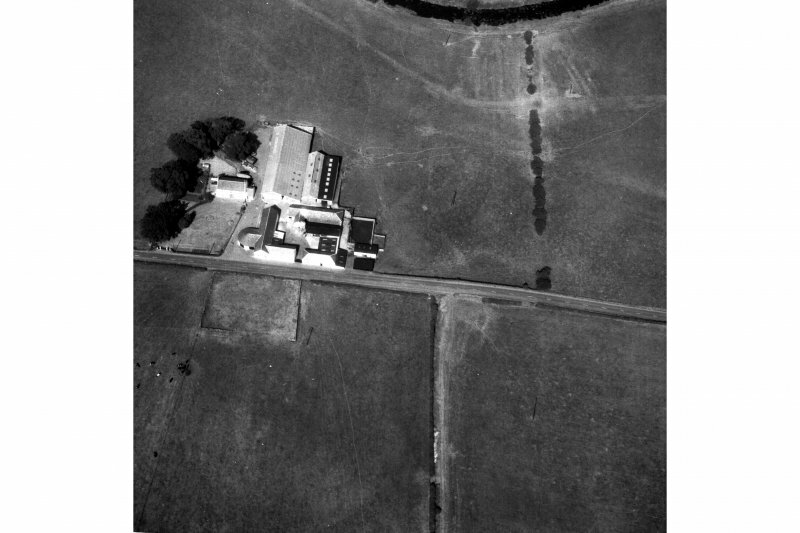 Alexander Gordon notes the Roman fort at Bemulie, and comments on the visible ditch. In 1732 Horsley notes that 'the ditch being here very wide and deep, appears in its greatest perfection'. Roy mapped the site of Bemulie Fort. Dr. John Buchanan notes, that Mr. Graham who grew up at the site of Bemulie recalled that the site was significantly altered by Mr. Charles Stirling. Present knowledge of the site is largely the result of excavations by S N Miller in 1912-4. Due to irregularities noted by George Macdonald in Miller's plan of the site, Mr. Mathieson was commissioned to resurvey the site, when necessary key-positions in the fort were reopened for the purpose with Mr. Miller's help. An archaeological watching brief was also undertaken in the vicinity of the Scheduled area.